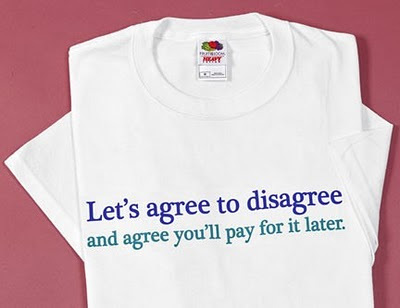 There are few statement I like less than "agree to disagree". It is a declaration of one's value of truth. I am not saying that we should not agree that we disagree, but what is really being said by such a statement is: "Since we disagree, let's not discuss the matter any further. I am not willing to continue exploring whether my belief or yours should be believed. We disagree, and the work required to overcome this obstacle will demand too much from both of us. The truth isn't really worth the discomfort of continuing this discussion. Wouldn't it be better just to drop the matter and go get some ice-cream?" Unfortunately, it seems that Christians have all too often opted for this kind of superficial unity. When was the last time you saw disagreeing believers, let alone pastors, really connect with one another in meaningful discussion and arrive at a mutual understanding and agreement on some matter of faith? Is it possible for such a thing to happen? By the grace of God, of course it is! The main problem is not that such a thing is impossible, but that the problem lies in our pride and our egos: we do not believe that such a discussion can happen without someone getting angry or offended. Who wants to admit they are wrong? I am convinced that this is the main reason why people choose to "agree to disagree" rather than seek the God-intended blessing of Christian like-mindedness. Therefore, instead of seeking to terminate our pride, we seek to terminate the conversation. What a failure for humility and truth! Should not pride be eradicated? And is not truth too valuable to be so quickly sacrificed at the altars of our personal egos? Most certainly, this is not what Christianity is all about. Ironically, it is at this very point - when we as Christians, with our semblance of unity, choose not to move into discussion with those we disagree with - that unity is undermined. We think by 'agreeing to disagree' we are preserving unity, but we are actually killing it. The moment the Church seeks unity apart from truth on account of fear we have become fractured, our fellowship becomes superficial, and what inevitably results is that we all end up going to our own little corners and huddles, never truly experiencing the sweetness of the true brotherly unity that Christ intends for us. "Behold, how good and how pleasant it is for brethren to dwell together in unity!" (Psalm 133:1) How rarely is such a statement heard today. We must understand that for such fellowship to be attained, brothers must dwell together in unity. Dwelling together means encountering one another, not hiding from one another. It means coming into contact with all of our brethren's uncomfortable idiosyncrasies and differing viewpoints. I think that most of us are afraid to dwell together. When we do come together we zip our lips and smile. Instead of connecting, we avoid, and before long we grow tired of saying nothing and so revert back to our corners where we feel free to discuss the things we long to discuss among those who are like-minded. Of course, we say we are all Christians and are unified, but is this the experience of true Christian unity? Is unity in the body of Christ only supposed to be between arm and arm, or foot and foot, and not between every member of the body? Since I am speaking about unity in the realm of theology and doctrine, it may be objected that there is more to Christian unity than just doctrine. Yes, Christianity is most certainly more than doctrine... but here's the thing: it is never less than doctrine. Every true Christian experience we may have, whether with God or with one other, is based upon truth and never stands alone as an experience by itself. Therefore what, may I ask, is more needful? Without truth we are left with nothing but illusion. It is truth that creates and orchestrates love (Galatians 5:6; Philippians 1:9). What is it that objectively unites us as believers but our "like precious faith" in the good news of our Lord Jesus Christ? That is doctrine. And what has subjectively separated us as believers but our doctrinal disagreements which we refuse to come to terms with as a body? If our unity as believers lies in anything other than that which is the truth of God then we destroy whatever is meant by "Christian unity", and we may have "unity" with any non-believer just the same. One may say, "I still think that other things, like pride and lack of love, are what separates us as believers." This is most certainly true, and I am not suggesting otherwise, but that our failure in the area of doctrine is nothing less than a failure in love and humility. It is not really because we disagree doctrinally that we separate, but because we will not face our disagreements on account fear, carelessness and pride. The issue of doctrine is simply revealing our true problem of pride, and therefore to run from the doctrinal issue is to run from our true problem. Yet should we not also greatly long to be joined together in one mind with our fellow believers? Should we not want our fellowship to include every member of the body of Christ? If we do not, what does that reveal? Should we not also value truth and our fellow brothers so much so that we care when we see a fellow Christian not understanding the Word of God correctly? If we honestly believe a brother to be in error, should we not move toward him and not away? Would we not want someone to do that for us? Thus our casual attitude toward doctrine reveals also our casual attitude toward our brother. Such a desire for like-mindedness in the Church is perhaps the single greatest contribution to real unity. Just as doctrine really does divide (Matt. 10:35), so doctrine really does unite. It is not that we must all believe the same things before we can be united, but when every member has a desire for like-mindedness - when instead of "agreeing to disagree" we begin to connect with one another in love and humility, seeking to bless and edify and attain to a mutual understanding in those matters in which we disagree - unity actually starts taking place. Real unity is experienced in our moving toward the goal of like-mindedness together, not merely in arriving at the goal itself (that's just the icing on the cake). This is because the act of simply moving toward each other, rather than away, necessitates humility of heart, love for the brethren, and the embracing of a greater vision of the body of Christ. "Till we all come in the unity of the faith, and of the knowledge of the Son of God, unto a perfect man, unto the measure of the stature of the fullness of Christ." (Ephesians 4:13) The average, contemporary understanding of unity is deficient and has brought us into a state that is far below the glorious ideal of Christian unity in the New Testament. Let us not settle for anything less than God's best for His Church: perfection of unity in truth and of love. May we be so dissatisfied with "agreeing to disagree", and may we see our fellow brethren and the truth as so valuable, and our pride as so ugly, that we could not but move toward one another for the sake of that true fellowship we are called to in Christ. As the world witnesses the horror of human suffering in the wake of the earthquake that decimated the Haitian capital early this year, we must not naively turn away from asking the hard questions, nor settle for the easy answers. There is something about a natural disaster that leaves us feeling helpless - in fact, that is what they are intended to do. A natural disaster cannot be controlled or anticipated. We are shaken out of our modern delusions of grandeur and are reminded that we, as men, are weak, small, pathetic, and are still at the mercy of the One Who created and rules over nature. The Bible has much to say about natural disasters, yet even those who claim to believe the Scriptures often fail in correctly interpreting such disasters. We are more comfortable saying it was a "random act of nature" rather than a "supernatural judgment". The latter certainly is not a popular message; actually, we may be hated for saying it. Nevertheless, we must be true, not popular. The prophet Amos, speaking by inspiration, said, "When disaster comes to a city, has not the LORD caused it?" (Amos 3:6) The historical and prophetic message of the Bible is full of examples proving this point. Nature is no longer in its original state of blessing because God cursed it as punishment for our first parent's sin (Gen. 3:17-19). The greatest natural disaster the world has ever known, the Flood, was directly instigated by God on account of mankind's evil and corrupt works, and nowhere is God ashamed to own that disaster as His doing. "And behold, I, even I, do bring a flood of waters upon the earth, to destroy all flesh, wherein is the breath of life, from under heaven; and every thing that is in the earth shall die." (Gen. 6:17) The destruction of the Egyptians by the ten plagues (Exodus 7-12), the calamities that befell the disobedient nation the Israel (Lev. 26:14-39), and the yet future outpouring of the wrath of God upon the earth (Rev. 15-16), to name a few, are all manifestly declared to be the direct doing of God. In fact, God is jealous that we do not confuse who is really bringing these disasters lest we think that He has not done them (Lev. 26:42, Deut. 32:27)! There is no sense in blushing for God when He Himself is not ashamed. One of the greatest lessons that we must learn about God is that God is a God of judgment. We are horrified to think that God would do such things because we do not see disaster as judgment upon sin. We have a naive view of ourselves as morally good, and therefore the thought that God would do such things to innocent and good people is for us a cause to accuse God of sin! Many people, attempting to defend God (as if He needed defending), suggest that disasters are not from God at all, but are just unfortunate happenstance. I do not know which interpretation is worse - accusing God of sin or accusing God of passivity- for both are essentially accusing Him of sin. It is only because we are unwilling to own up to our sin, and that we are in fact sinners, and that God is just in judging us for our sins, that we either accuse God of being an evil tyrant or an incompetent ruler. Our proud unwillingness to consider the Biblical message of sin and judgment is the best proof of the reality of our sinfulness, and therefore of God's just judgment against it. How then should we interpret the present crisis in Haiti? To begin with, we must come to understand that this disaster is, as all such disasters are, a judgment of God against sin. These things do not happen by accident, as if God was clumsy; nor arbitrarily, as if God was cruel. Jesus prophesied that as the age draws to a close earthquakes and other natural disasters would become more and more frequent and intense. "And great earthquakes shall be in various places, and famines, and pestilences; and fearful sights and great signs shall there be from heaven." (Luke 21:11) These "beginnings of birth pangs" (Matt. 24:8) will find their culmination in the final outpouring of judgment upon the world at the end of the age (Rev. 16:18). Therefore such disasters should not surprise us. It is essential that we acknowledge such disasters are from God. But it is also absolutely essential that we see that these disasters are judgments from God against all sin. An earthquake did not strike in Haiti because they are worse sinners there than in any other part of the world. If we know that "the wrath of God is revealed from heaven against all ungodliness and unrighteousness of men" (Rom. 1:18) then truly in any place and at any time could such an earthquake happen. This is true of all calamity, whether it be an earthquake or a mere car wreck. "And Jesus answered and said to them, 'Do you suppose that these Galileans were worse sinners than all other Galileans, because they suffered such things? I tell you, no; but unless you repent you will all likewise perish. Or those eighteen on whom the tower in Siloam fell and killed them, do you think that they were worse sinners than all other men who dwelt in Jerusalem? I tell you, no; but unless you repent you will all likewise perish.'" (Luke 13:2-5) What happened in Haiti did not just happen to them, but to all mankind as a corporate body of sinners, and should cause all men to repent and confess their sins to God, turning to Him for reconciliation through Christ. The third most important thing we must understand about the Haitian crisis is that God's judgments are actually mercies from Him, "Who desires all men to be saved and to come unto the knowledge of the truth" (1 Tim. 2:4). God sends His judgments so that men can see and understand the truth about their sin and and the reality of His justice. How else can we be awakened from our egotistical self-righteous stupor when we are unwilling to consider the plain Scriptural revelation? God chastises the world in love, but, as we have seen from the past, the pride of mankind does not humble itself so easily. Pharoah did not humble himself after the first judgment, nor the second, nor the third, nor the fourth, fifth, sixth, etc... up to the tenth; and even after the loss of his own son he did not humble himself, but pursued the Israelites through the Sea unto his death. What will it take to humble mankind? We are informed by the Scriptures that this Haitian crisis will not be the last. "If men will not repent when God gives opportunity through calamity, then we open ourselves for yet a greater suffering." (Art Katz) God is sending a message to the world: Acknowledge your offenses and humble yourselves, and turn to the Lord your God. It is because God loves the world that He sends these judgments. "The Lord is known by the judgment which He executes." (Psalm 9:16) To embrace the truth about God's judgment is to embrace the truth about the cross of Jesus Christ, and to find there the mercy and forgiveness which we as sinful people so desperately need. God publicly set forth Christ as a propitiation in His blood for all men to see, and by seeing the cross of Christ as the judgment of God against sin we see the horrid revelation of what our sin is and the inflexible holiness of God in His justice. But we also see, most of all, the incomprehensible love of God that eclipses all love we have ever known. For it was there on the cross that God the Son suffered in the place of sinful men so that the grace of forgiveness might flow freely to lost, guilty sinners. The broken body and shed blood of Jesus Christ for the world is all that is needed to reconcile sinful men and women to God. "He that believeth on the Son hath everlasting life: and he that believeth not the Son shall not see life; but the wrath of God abideth on him." (John 3:36) Every chastisement that we experience from God should cause us to stop and consider that one great Chastisement from which comes our peace with God (Isaiah 53:5). But how long will men refuse to look? A final word: What shall we say about those believers in Christ who are suffering immensely in the wake of this judgment? Shall we say that for them it is only unfortunate happenstance? We dare not. We must remember Job's faith-filled words which he uttered on the day of his calamity: "The Lord gives and the Lord takes away; blessed be the name of the Lord." (Job 1:21) As we learn from the patience of Job, for God's people, suffering has an entirely different purpose. It accomplishes two things: one, it teaches us how much God truly loves us, for He disciplines us for our own good that we may be a partakers in His holiness (Heb. 12:10). As Christians, we all have many rough edges, and only through suffering can we learn to draw near to Him, to forget ourselves in Him, and to trust wholeheartedly in His goodness. Secondly, suffering works into us compassion and empathy for others who suffer, for even as Christ our High Priest had to learn this also through suffering, so must we as "a nation of priests" learn compassion through suffering. "For in that He Himself hath suffered being tempted, He is able to help them that are tempted." (Heb. 2:18) "For we have not a High Priest which cannot be touched with the feeling of our infirmities; but was in all points tempted like as we are, yet without sin." (Heb. 4:14; see also 2 Corinthians 1:3-7) For Christians, as it was with Job and with Christ, suffering does not mean judgment against sin, for we, in Christ, are sinless in the sight of God. But as all suffering is ultimately related to sin, Christ identified with sinners in their suffering so that He could be a merciful and compassionate High Priest. In the same way God causes His people to suffer for their good, to learn to trust Him; and for the good of others, to learn to empathize with the lost. 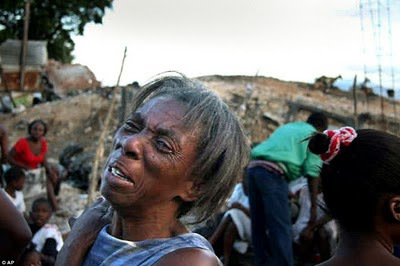 Let us identify with the sufferers in Haiti at this time. Let us not gloat over them and think that we are any better than they are, or that they are any worse than we are. Let us see this earthquake as a judgment from God against all sin, Who is both just and merciful in all His deeds. Let us learn to know God in His judgments, and God as a God of judgment, that we may see the glory of the crucified Christ as crucified for our sins, and by doing so know God as a God of love. Let us not persist in naive and unreal thoughts about our supposed 'goodness' as people, but humble ourselves as sinners before the Lord, taking refuge in His blood. If we do not learn from these judgments we can only expect to receive worse from God's hand, until all the world finally knows that He alone is God, and that before Him we are all as but a drop in a bucket.